Very hairy, don't you think? Hat Tip to Yahoo! Movies. But why do you count Dinosaur or The Wild as an animate feature? The first is not totally animated (and Disney never counted it as animated feature), the second is not Disney. 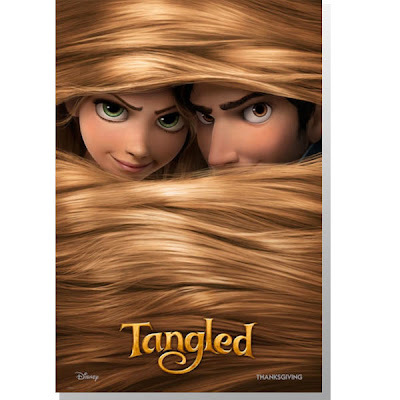 Did you manage to take a look at the Comic Con panel for "Tangled"? If so, when do you think we can expect one of your excellent write-ups on it? I don't count "The Wild" and neither does Disney, but they do count "Dinosaur." Ok, I actually like it. Evokes the Rapunzel story but also hints that there is something fun and mischievous going on too. Maybe marketing will finally start to figure out a good campaign for this. But I do really wish they would go back to the "Walt Disney Pictures Presents" instead of the simple "Disney" logo. I think it carries more weight. It's been changed because Iger prefers to work for a company rather than for the legacy of a far-greater man. He hates to be reminded of that. That's how his little bean-counter mind works. I actually really like that. It's cute. Not really gagging for "Walt Disney Pictures Presents.." but I would always prefer just "Walt Disney" as the branding. I get that the concept of branding is to keep things simple. Anonymous #3, you are wrong and you know it! We DO NOT need another "Save Disney" campaign, nor do we need a "Save Walt" one! And the company DOES NOT need a new CEO right now either. Iger is perfect in the role and is still WAY better than Eisner. Besides, the "big, scary" Eisner years are long over. Time to move on already! A "Save Walt" campaign? Sign me up! A "Save Walt" campaign is NOT needed and WILL NOT happen! Whenever I see this poster it looks to me like the two characters are in a bed together.